So after I posted my passionate plea for more nice stuff to watch/read, stuff that wasn't going to totally bum me out, I got an amazing response from all of you. I'm definitely going to have things to add to my list now. But I also got a really funny response from my mother, who knows me pretty well, as you might guess, and came up with some spot on suggestions to get me out of my funk. She told me I should try to reread some of the Redwall books (because I was legitimately obsessed as a middle-schooler), reminded me that I love Felicity from Arrow, and then gently suggested that I write about Ever After. Which made me realize something very important: in the two and a half years I've been doing this blog, this is the first time it's even occurred to me to write about Ever After. That is weird. That is deeply deeply weird. Why? Because I love that movie so, so much. I love everything about it. I even love the things about it that I shouldn't love. It's just so...girl power. And as much as I love radical feminism, some days, you just need a little bit of feel-good girly power. You know? 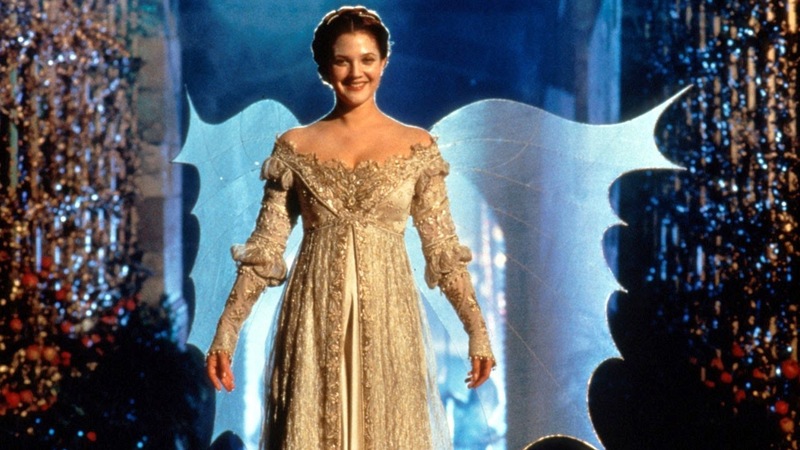 To give a little background, Ever After, which came out in 1998, was a star vehicle for Drew Barrymore, hitting right at the apex of her romantic comedy career. It was probably supposed to signal her arrival as a "serious actress", and I guess it does an okay job at that. 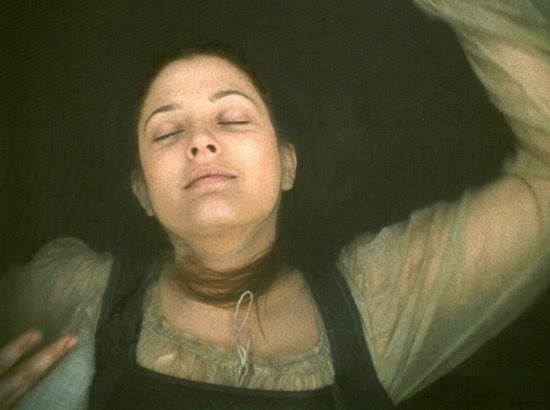 From an objective standpoint, she's really weirdly cast, but from a completely subjective view, I love the movie and I really love her in it, so whatever. The movie, officially titled, Ever After: A Cinderella Story, is exactly what it sounds like, a Cinderella story set in the late middle-ages, without any magic, but with plenty of anachronisms and silliness and pretty dresses. Barrymore plays Danielle, a noblewoman whose father passed away when she was a child, only shortly after he married his second wife, Rodmilla (Anjelica Huston, being amazing). Like the story usually goes, Rodmilla reacts badly to her husband's death, and eventually Danielle finds herself as a servant in her own home, while her step-mother and step-sisters (Megan Dodds and Melanie Lynsky) squander the family fortune and try to attract the notice of eligible suitors for the girls to marry. The final straw comes when Rodmilla sells one of the servants, Maurice, who has been like an uncle to Danielle. The servants are devastated when they realize they have no way to get him back. 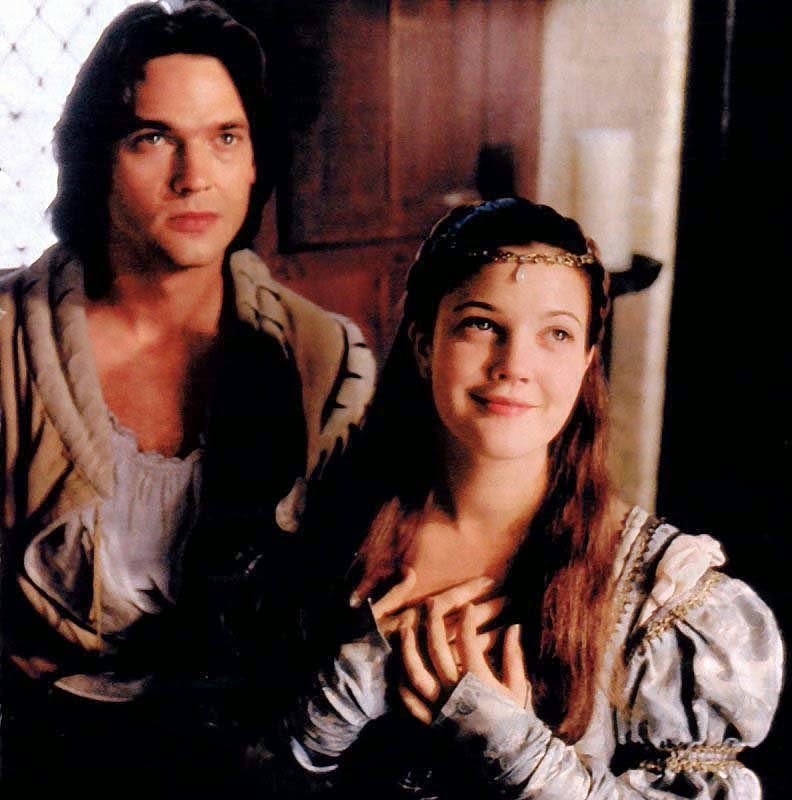 That is, until Danielle stops a man trying to steal her father's horse (she pegs him with an apple), and when it's revealed that the man is actually Prince Henry (Dougray Scott), he gives her a pouch of gold to keep quiet. It's this gold she can use to free Maurice, but that has to done in person. Aaaaand, it has to be done by a noblewoman, not a servant. So Danielle dresses up in her mother's clothes, goes down to the palace, and uses her commanding knowledge of Thomas More's Utopia to bargain for Maurice's freedom. Which is cool, until she runs back into the Prince, who is smitten and confused and positive he's seen her before somewhere. Romance ensues. Awkward romance where Danielle is constantly trying to hide who she is, and Prince Henry is kind of a jerk sometimes. Oh, and Leonardo da Vinci (Patrick Godfrey) is the fairy godmother. Good times. As you can probably tell, the story itself isn't super surprising. It's easy to see where it's heading, and there really aren't many shocks or bumps along the way. Henry and Danielle fall in love, all while she tries to hide the reality of her situation, and Rodmilla and Marguerite (the evil stepsister) conspire to steal Henry's heart. Or at least his wallet. Eventually Henry finds out about Danielle and he reacts with all fo the dignity and love that one would expect from a man who's been raised with near unimaginable wealth and privilege. Rodmilla reacts badly too and decides that Danielle should be punished: she sells her off to this super sketchy noble who wants Danielle for...unsavory purposes. And Danielle is sad and unhappy. Henry realizes he's made a terrible mistake and goes off to save her. Until, that is, he gets there and finds that she has already rescued herself. Which is kind of the point of the movie and why I love it. 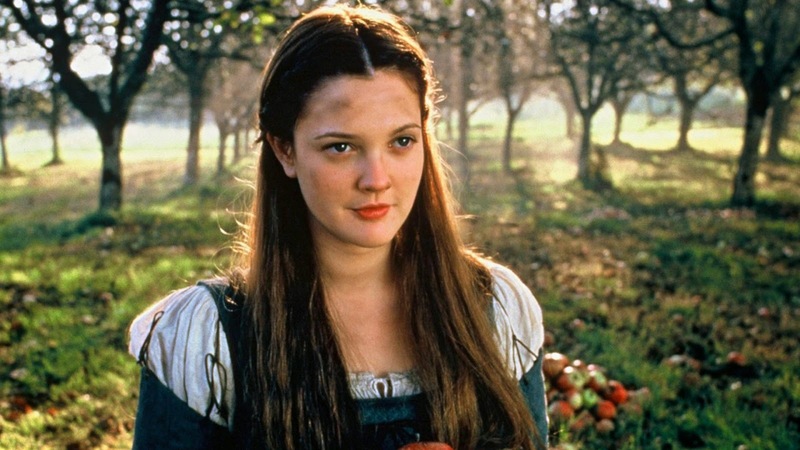 Danielle, for all that she is a traditional romantic heroine who swoons and stutters and loves looking beautiful and marries a prince, is also a really radical person, at least for this kind of movie. She's a woman who likes dressing up, but also happens to have enough of an arm to be able to knock a guy off a charging horse with an apple. She gets all dressed up for a picnic, and then saves her date from bandits by picking him up and carrying him away. She gets sold in servitude, and then slashes at her master with a sword for a while until she just can walk out of the castle scot free. What makes this story really unique in terms of Cinderella fables, is that it's all about choices. Each of the characters has to choose what they're going to do. Danielle has to choose to continue seeing the prince. She has to choose whether she's going to end up with him in the end. The Prince has to choose who he's going to marry, what his fate will be. Even the step-sisters have to choose how they're going to react to the situations in their lives. That's rare. There's really no "fate" in this movie. There's no love at first sight. It's hard. It's real. And the fact that they choose makes it all mean a lot more. 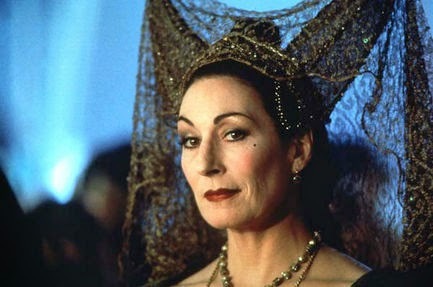 Oh, and she's a brilliant woman with a love for justice, freedom, and Thomas More's Utopia. She's a pretty, resilient, hard-working, smart, rabble-rouser who marries a prince. No, she doesn't really have any flaws and she doesn't really change throughout the story. But really that's fine. She's awesome. She's everything I wanted to be when I was twelve. Actually, she's everything I want to be now. The biggest and easiest criticism of this movie is that it's wildly anachronistic. Danielle is a revolutionary thinker, a proponent of free speech and democracy hundreds of years before those ideas became popular. And some people find that irritating, people who really want their movies to adhere to a specific timeline, I guess. Personally, that's why I actually like it. Sure, most noblewomen probably didn't know about radical ideas of personal liberty, but who cares? Don't you prefer the version where they did? And, more than that, who exactly is saying that there's no way Danielle would have known about this stuff? When it comes down to it, why wouldn't she? Historical women did a lot more stuff than we give them credit for. They ran revolutions, were pirates, invented science, started universities: women did much more than is recorded in most history books. Ultimately, it comes down to a choice. Are you going to suspend your disbelief and your cynicism, your ideas that Danielle is really just a modern woman in an old-fashioned dress and go with it, or are you going to complain? The good answer, for the record, is that you aren't going to complain. Complaining is bad. If this scene doesn't make you cry, I don't understand you. The girls were taught how to create fashion trends by having initials knit into mittens and stockings. The alphabet was knit into mittens and sometimes even a verse of poetry.